You may or may not have heard people talk about having a clay bar service or clay bar treatment done on their car. What is a clay bar and why is it important? 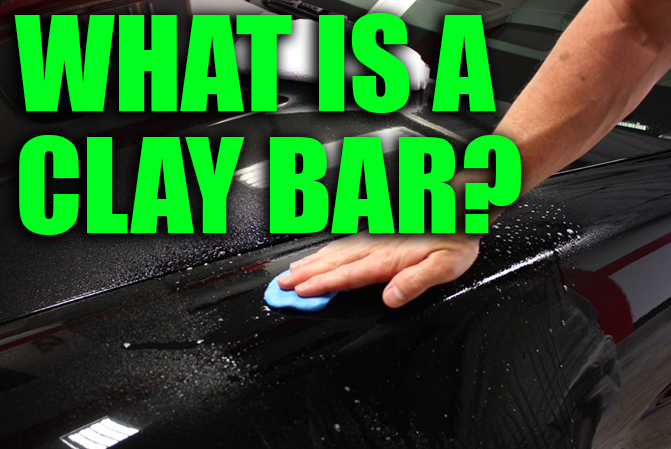 Today, I’m going to talk to you about what a clay bar is and does and why a clay bar service is necessary and also why it is good for your car. I will do my best to explain the what, the why and the how of clay bar treatments. The exterior of your car essentially has 3 levels of paint coats. Those paint layer coats consist of primer, then the paint (the color), then the clear coat. The primer does the same thing on a car that it would do when you paint anything else. The primer preps the surface for paint and allows the paint to attach itself to the body much better than just painting straight onto a bare surface would do. The next level is the paint. The paint is what gives the car it’s color and attraction. The final level and also level that it not known very well is the clear coat. The clear coat may just be the most important part of any of these levels. The clear coat protects the paint from the elements. Elements that may include contaminants from various weather conditions that may occur, brake dust, bugs, dust, rocks, and salt from ice melt. If you run your hand across your paint and it feels like sandpaper at all, it is contaminated. My main focus will be on the clear coat and how a clay bar service can help it. Although the clear coat does protect the colored paint layer. It’s not invincible. This is why people put wax, sealants, and ceramic coatings on their vehicles. Protecting the clear coat is extremely important to protect the integrity of the paint. If the clear coat is not protected and ends up being weakened from the elements that I mentioned, over time it will cause irreversible damage to the clear coat and even the colored paint. Now to get into what brought you here in the first place. The CLAY BAR! I will go over what happens to the clear coat which leads to the need for a clay bar treatment. As you drive and use your vehicle more and more the need for a clay bar treatment will only increase. Some of the elements and contaminants that I mentioned above can actually get embedded into the clear coat. Most of those elements will be small pieces of dust, metal and rocks that will mostly be unseen by the naked eye. Washing might be able to remove some of this but there will be many dust particles and other contaminants that will be embedded into the clear coat. How do we go about removing these things? I’ll let you guess. If you guessed clay bar, you are correct. The clay bar has the ability to grab the contaminants that are embedded into the clear coat and lift them off and out of the clear coat. How about that? Science!! Using a showroom shine or quick detailer spray (without a wax) is probably the most popular method and is the way I’ve done it the most. This allows you to work and not worry about any negative consequences of letting it dry after you finish a section and move onto the next one. The next method is while you are washing the car and after you have gotten everything wet and sudsed up. This way can be kinda tricky, the reason being that water and soap can dry quickly before you are able to get to it. This sometimes can leave soap staining or leave hard water deposits. You make sure the whole surface stays wet the whole time until you can fully rinse and properly dry the car. Many times, doing a panel at a time is the most effective way in those circumstances. You can also use water but be careful because water will dry quicker and you may need to rewet constantly. Sometimes as you are clay barring, you may hit a drier patch of paint. Sometimes when this happens, it can cause you to drop the clay bar. If this happens, THROW IT AWAY! When you think of what a clay bar does while using it, don’t think it stops doing that when it is dropped. It is made to make things stick to it and it doesn’t stop doing that when you drop it on the ground. When you drop it, it will then have picked up dust, small rocks, maybe glass, a shoe, small children… Okay the last two aren’t true, but everything else that it can pick up will end up doing more damage to your paint. Even if the damage is very small and unseen to the common eye. Those things will not come out of the clay bar. It is designed to grab things and not let go. So when it comes to your paint, we can be grateful for the technology of the clay bar. When we drop it, we occasionally will curse the technology of the clay bar. Another thing that can happen if you do not use enough lubrication is paint marring. The clay is designed to grab onto contamination with proper lubrication. Without it it will grab onto the clear coat and you can damage it if you are not careful. Overall it is a pretty simple process but needs to be done correctly and carefully. The basic things to remember while clay barring is to keep the surface wet and lubricated, do small sections at a time (about a 2 ft by 2 ft area), regularly refold and re-smash the clay bar to keep the surface of the clay bar as fresh as possible. And remember to NOT DROP it. 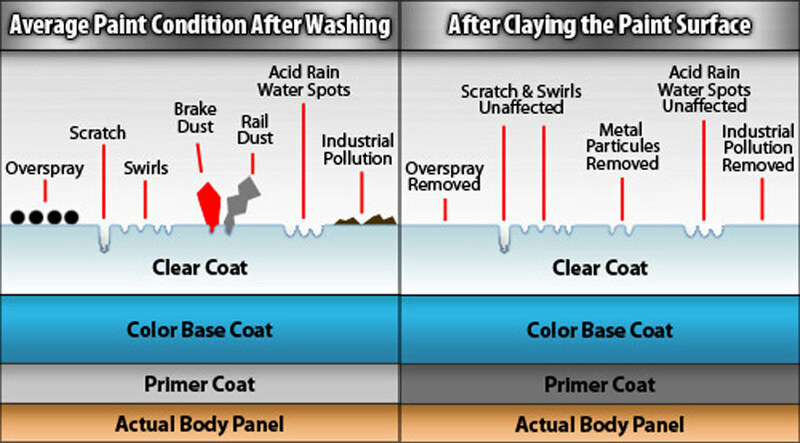 In cases when you will be doing paint correction, the clay bar treatment will be one of the first steps in preparing for the paint correction process. (After a thorough wash as well). You will want to make sure that you do a very good clay bar procedure before any compound or polish even touches the body of your car. The reason for that is found when you look at what the clay bar does. 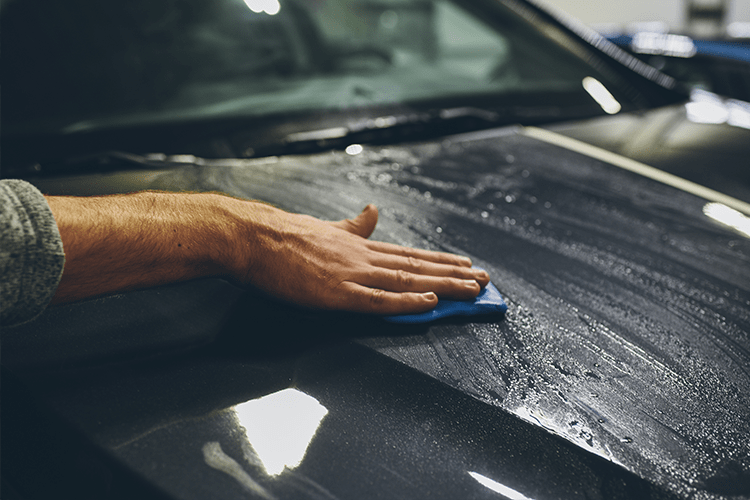 After removing all of the contaminants out of the clear coat of your car, buffing and polishing will be much more effective after having removed all of those elements. If you were to proceed without clay barring, those contaminants would be absorbed into whatever buffing or polish pad you are using. If the pad absorbs the contaminants, those contaminants can cause the buffing or polish process to not be as efficient or done as well and still make microscopic scratches. Also, if the pad and compound cannot come in contact with the areas of the paint where there are contaminants, that will also make a difference on how good of a job you’ll produce. In conclusion, no matter what kind of vehicle you are driving or how often you wax it or take care of it, you’ll eventually need a clay bar treatment. The exception might be a show car or car that does not actually drive out on the road. Every car gets clear coat contamination to some degree, especially over time. Reach out to us for more information on getting your vehicle in for a clay bar treatment. We’re here to help. Is car wax dead? A few reasons why you should detail your daily driver.